ADF/BAND, COSMOtherm, Jaguar, Gaussian, MolPro, Q-Chem, PCModel and Spartan. We will also make our best effort to install any other packages you might require. There is a single set of users and home directories on all systems (with the exception of the root and tech accounts). The user password files and the home directories reside physically on the master and are accessed transparently from the slaves. We will preinstall user IDs on request. The machine is ready to use "straight out-of-the-box". Simply plug in and switch on (instructions provided) and you should be able to submit jobs within about ten minutes. Hard-copy manuals plus a test suite for the PQS ab initio program is included. This is a fully operational research computer and is not restricted to running exclusively PQS software. It includes Fortran and C/C++ compilers and Java interpreters, and can be used to compile and run your own programs, and those of other software vendors. 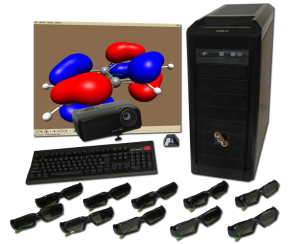 QuantumCubeTM turnkey computational chemistry clusters are designed for office use. Power and cooling requirements do not exceed facilities found in a typical office environment. Standard 20 AMP power receptacle and residential-grade air conditioning are easily sufficient for optimal operation. 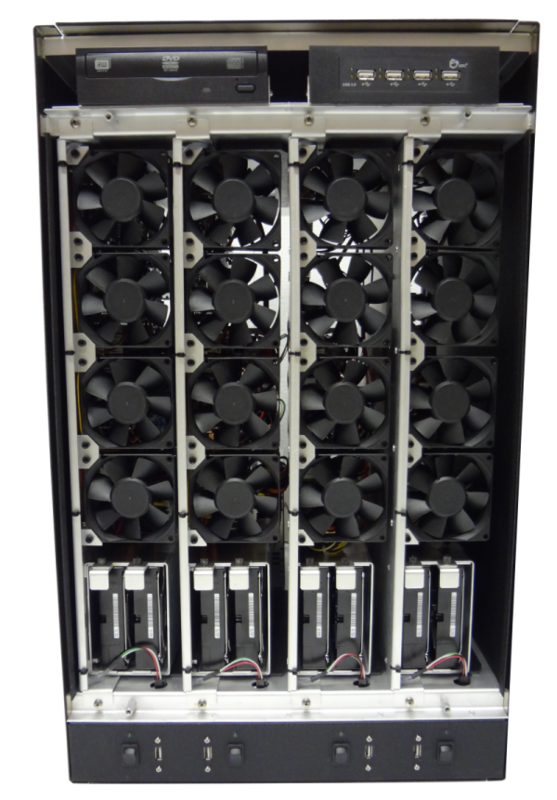 Large, efficient 80 mm fans used in combination with straight air flow design reduce the heat and noise generated by the machines to below office acceptable levels (QuantumCubeTM machines are often less noisy than many desktop PCs). 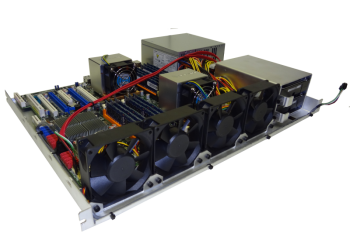 Its small size, low noise and relatively small heat footprint make the QuantumCubeTM an attractive solution for institutions without dedicated computing facilities. 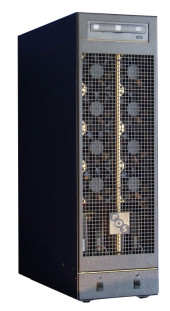 The QuantumCubeTM clusters use two types of chassis: one with two nodes and one with four. 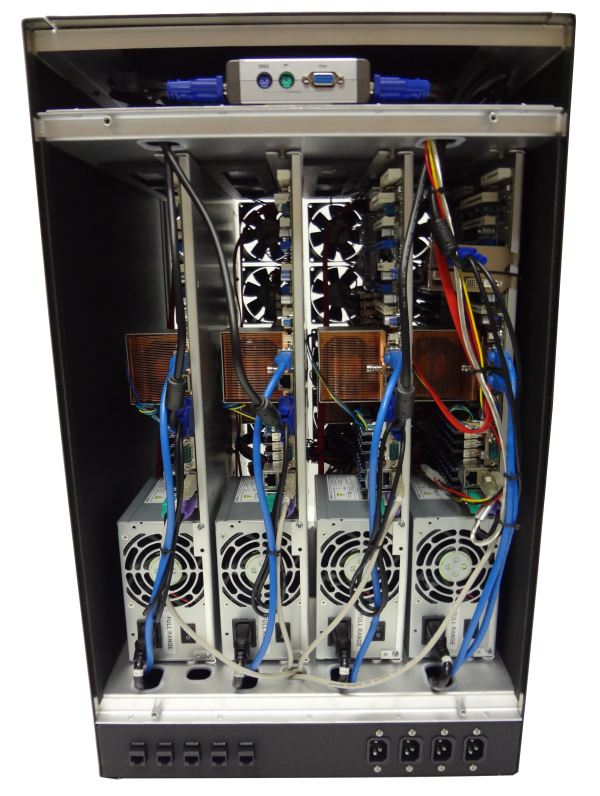 Each node is installed on a removable tray which mounts inside of the chassis enclosure. A node consists of a motherboard, two cpus, two hard drives configured with RAID, a power supply and four 80mm cooling fans at the front of the tray. The network and power cables are routed to the ports on the back of the base, while the power switch/led light cables and usb cables are routed to the front of the base. All nodes are connected to a KVM (keyboard/video/mouse) switch at the top rear of the chassis. 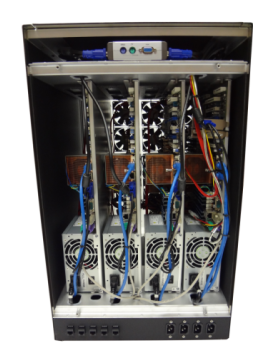 Top front of the chassis contains a dvd drive and on four node chassis an additional 4 port usb hub. Routine HF & DFT geometry optimization and other jobs that are CPU bound are perfect applications for machines with high number of cores, such as the 128-core QS128-2500C-OS16 QuantumCubeTM. For calculations involving correlated wave functions, such as MP2, CCSD(T), which are I/O bound, a machine such as the 32-core QS43-2670C-XS8 is preferable. This configuration offers more computing resources (memory, disk bandwith) per core. Approximate dimensions of the unit are: height 26" width 8" depth 19"; weight around 55 lbs. The maximum power usage is about 600 W under load. 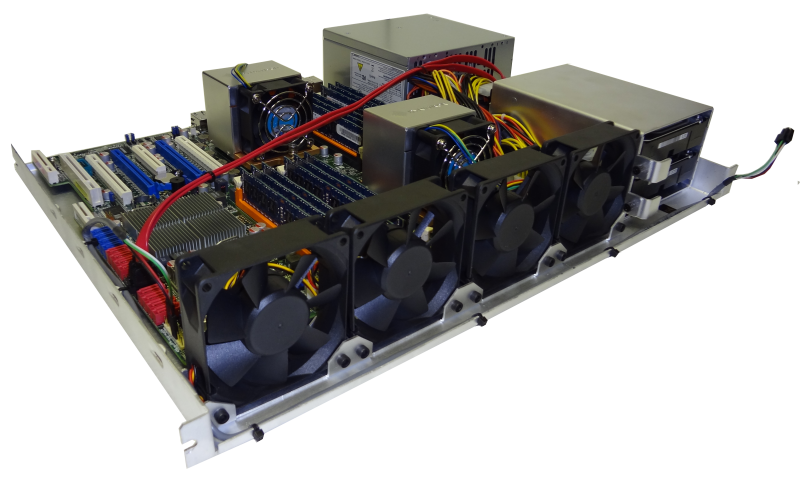 The power and cooling requirements of our system do not exceed what is normally available in a standard office environment. Approximate dimensions of the unit are: height 26" width 15" depth 19"; weight around 100 lbs. 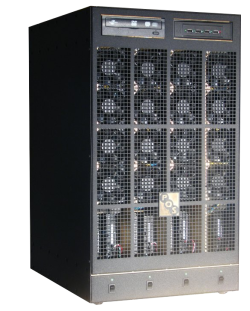 The maximum power usage is about 1200 W under load. The power and cooling requirements of our system do not exceed what is usually available in a standard office environment. Thanks to recent advances in monitor and projector technologies, we are now able to offer a new 3D stereo enabled line of workstations - the StereoStationTM. The stereo effect is achieved through the use of active shutter glasses operating at 120Hz refresh rate. The glasses are synchronized with the display, either a projector or a monitor, producing two distinct images, one for each eye. The effect is quite breathtaking and is far superior to the earlier technologies of passive polarized and anaglyph (red/blue) glasses. A number of scientific applications which use OpenGl libraries have been capable of displaying stereo images for some years, however the cost of the necessary hardware until recently has been prohibitive. Our systems are preconfigured to run the stereo-enabled version of the PQS suite. Stereo-enabled PyMol is also installed. Additionally we offer support in installing 3rd party applications on our machines. Please inquire about specific applications at sales@pqs-chem.com. 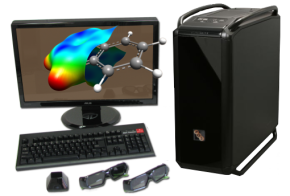 Intended to be used as a small personal workstation, capable of executing serial PQS jobs and stereo visualization of the results for up to 2 people. 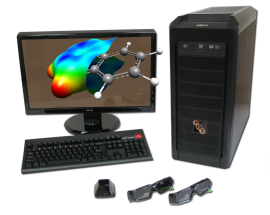 Intended for a classroom or research environment, capable of executing serial PQS jobs and stereo visualization of the results for up to 10 people. Intended for use as a large scale workstation or add-on to an existing PQS QuantumCubeTM. 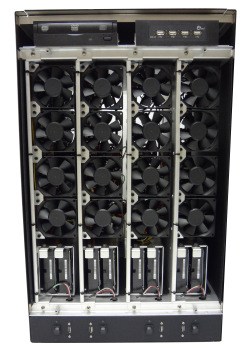 24-core, 64 GB of memory Linux node, capable of running a large fully parallel PQS caclulation. Results can be viewed in stereo by up to 2 people. We offer a full, 1 year warranty on all hardware components. Should you have any problems, you can, at our discretion, either return the affected equipment to us for repair or replacement, replace components yourself following our instructions, or we will make the repair on site. This warranty can be extended to 2 years for an additional 10% of the system price. Within your warranty period we will offer phone and email support as well as remote access (via ssh) support if such access is allowed at your site. If an extended warranty is purchased, then any part not used after 2 years may be credited towards the cost of a new QuantumCube TM if purchased in years 3 or 4.